ESSAY-LIKE SUNDAY MORNING: Today’s lesson was brilliantly taught by Sister Johnson. The lesson was entitled, “SEEKING CONTINUITY AND PERMANENCE”. The Scripture was from Hebrews 7:1-3, 19-28. The KEY VERSE was verse 24 which reads, “Because Jesus lives forever, He has a permanent priesthood” (NIV). The writer of Hebrews faced a daunting task, that of convincing early “Christians”, who still revered Moses and Father Abraham, and whose tradition dictated that the male descendants of Jacob’s son Levi, the patron of one of the “12 tribes of Israel”, be the designated “priests” of Israel. They were the only ones allowed access to the “Holy of Holies”—the place where God dwelled on earth. In previous lessons, “the writer” contended that Jesus was greater than all of the prophets, the angels, Moses and Aaron, and the designated, “high priests” of the Levite lineage. Change can sometimes be a great obstacle to progress. The Jewish people’s acceptance of Jesus as the one and only “High Priest”, represented a major change and a stumbling block for the continued advancement of the people as Christians. So, the writer used the exemplar of Malchezidek, from the time of Father Abraham, whom they DID accept as a great “High Priest”, to show that not all priests and therefore THE “High Priest”, had to descend from the line of Levites. According to the Hebrew’s writer, Jesus, was a “High Priest” in the order—along the lines of—Malchezidek, who had no known genealogy nor death, and therefore they should have no trouble accepting Jesus, since they had accepted the teachings that Malchezidek was of this ilk. In 1886, Karl Benz developed a petrol- or gasoline-powered automobile. This is also considered to be the first “production” vehicle as Benz made several other identical copies. In other words, Benz’s automobile was the “prototype” for the modern-day automobile. Up until that time, most people depended upon the horse-drawn, carriage or wagon for transportation and transport of goods over the rough wagon roads of the time. As a matter of fact, most people humored themselves by making fun of the “horse-less carriage”. Naysayers declared that it would never catch on. They laughed and decreed the quest for any method other than the horse, mule, or ox-drawn wagon or carriage was a “fool’s errand”. So, for the next several years, Americans went on traveling in the tried and true tradition of their forefathers. In October 1, 1908, Henry Ford introduced the Model T, gas-powered motor vehicle to the world. It had the steering wheel on the left, which every other company soon copied. The car was very simple to drive, and easy and cheap to repair. It was so cheap at $825 in 1908 ($21,760 today) (the price fell every year) that by the 1920s, a majority of American drivers had learned to drive on the Model T.
The change from wagons to automobiles was a hard fought one but inevitable, and permanent. 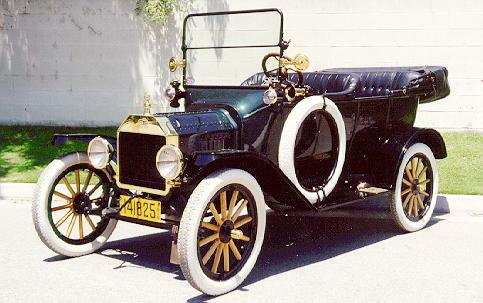 The Model T was the early forerunner of modern-day automobiles. By 1918, half of all cars in America were Model T’s. Malchezidek was the prototype of the type of “High Priest”, that Jesus was later to become, just as Benz’ early model of the automobile was the prototype of today’s automobile. It’s hard to imagine how we ever got along without them. Jesus is the HIGH PRIEST. The Hebrews writer wrote a whole book to convince the early “Christians” and Jews that this was the case. We as modern day Christians should know from today’s lesson that Jesus is the WAY, THE TRUTH, AND THE LIFE, AND THAT NO MAN, GETS TO GOD EXCEPT THROUGH HIM; not priests, nor angels, nor prophets, nor preachers, nor president, nor any man. Our textbook concludes the lesson this way, “Change is the operative word in the world in which we live. It comes in many forms and has led to feelings of pessimism and doubt in the lives of many, including those within the community of faith. Change is necessary and yet we fight against it with all our strength. Without change, how could we progress in life or in technology? You so adeptly explained this concept by comparing the concept of the High Priest as a prototype with the Mercedes Benz as the first car. We need faith more than ever. We need to believe. Thank you for this thought provoking essay. Thanks for your on time comment on change!!!! As always, my pleasure, Ron!